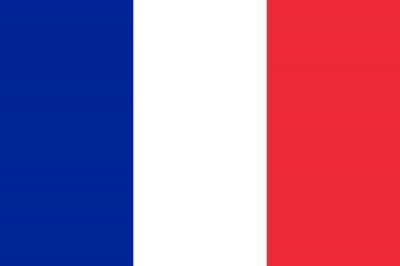 Basic facts and profile information about France (French Republic): commonly used name, full official name, flag, language, capital city, time zones, population, land area, population density, GDP, DGP per capita, ISO2/ISO3 codes, Internet domain name, etc. Currency: € - EUR (Euro). Calling Code: +33 for telephone dialing in. Capital City: Paris with latitude of 48.50 and longitude 2.20. Airports: Le Bourget (LBG) at Paris. Charles De Gaulle (CDG) at Paris. La Defense Heliport (JPU) at Paris. Gare du Nord (XPG) at Paris. Gare Montparnasse (XGB) at Paris. Population and Rank: 65,821,885 people lives in the country. 0.95% of the world total population. #21 of highest populations in the world. Land Area and Rank: 640,294 square kilometres of land area. 0.43% of the world total land area. #42 of biggest countries in the world. Population Density and Rank: 103 people per square km. #95 of highest population densities in the world. GDP: 2,582,527.00 GDP (Gross Domestic Product) in Millions of US $. #5 of highest GDP in the world. GDP per Capita: 41,019.00 GDP per capita in US $. #18 of highest GDP per capita in the world. Cell Phone Population and Rank: 58,730,000 cell phones in use. 1.27% of world total cell phones. #17 of highest cell phone populations in the world. ISO2 Code: FR assigned as the ISO 3166-1 Alpha-2 code. ISO3 Code: FRA assigned as the ISO 3166-1 Alpha-3 code. Domain Name: .fr used as the top level Internet domain name.